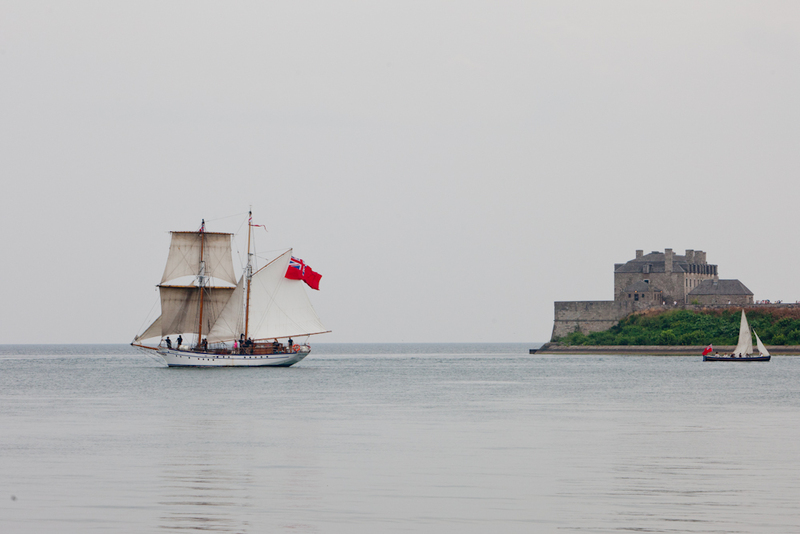 Last Sunday, more than 1000 spectators gathered in Queen’s Royal Park to take in the Naval Reenactment on the waters around Old Fort Niagara. On the American side, another large group took in the festivities. As I walked up and down the sidewalk it was clear most were there for the spectacle – and it was quite a sight. Five Tall Ships (4 Brigantines and a schooner – 1812 Squadron) and 22 longboats with more than 300 naval re-enactors took part in the weekend festivities. On the shores, a gristled group of re-enactors put on a firing display to emulate how land troops might have participated in the battle on the water. 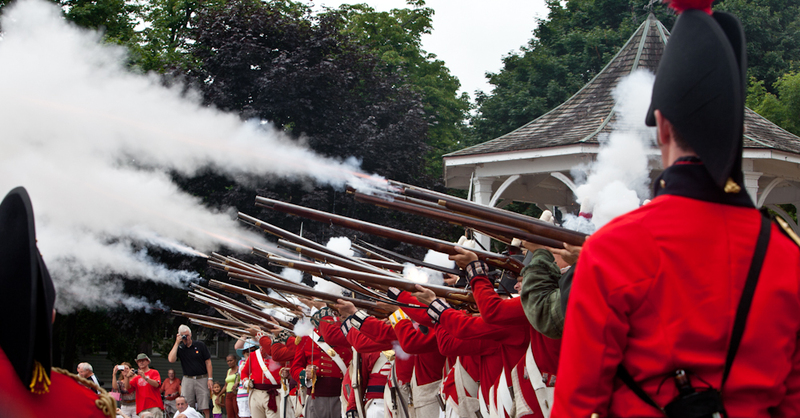 As I walked in and around the crowd, I overheard a series of conversations on the “history” of the War of 1812. A mixture of myth, half-truths, and outright invention guided the historical conversation and caused me to give thought to the value of these staged events. As an historian I’m torn on the role of re-enactors and the battles they reenact. They are enthusiasts who give us a little piece of a time gone by. Their uniforms, their equipment, their ships (!!) all play a role in taking us back in history 200 years ago. This is all positive if it leads to a genuine desire to further understand the past. If the public engagement ends with the firing of a few blanks and the admiration of the sharp red uniforms on a warm Sunday morning at the park, we are in danger of trivializing the past. Whenever I explain the role of the historian to my family – a conversation every PhD student endures as inquiring minds try to understand just why you’ve chosen to spend your time analyzing the past – I tell them that my job is to help people understand the Human Experience without doing a disservice to the very complicated lives they led. As we begin to engage with any new topic/adventure/person in our life we always start with a basic understanding, a basic story. If we want to know more, we have to take the time and wade through the pool of complexity to sort out a more nuanced understanding. The job of an historian is to arrive at a coherent understanding of the past on the other side of complexity. That is what we are working towards with 1812: A Guide to the War and its Legacy. The history that Terry Copp has written so far goes a long way to cutting through the complexity of any one battle to give you an excellent and easy to understand account, without doing a disservice to the complexity of the time period. Geoff, Nick, and I are working now on how to present the legacy of the War of 1812 in much the same in the tour section. Click here to support the publication of the Guide. With very little publicity we have currently raised 10% of our goal of $9987.00.